According to this simple definition, TH is the collection of the TIs (see last week’s essay) from all of the prior transactions going back to the manufacturer. By this definition, a drug sold by a secondary wholesale distributor (a non-Authorized Distributor or Record, ADR, for this drug), to a pharmacy, the pharmacy (the dispenser) should receive a TH statement composed of the TI that the manufacturer originally provided to the first wholesale distributor (the ADR), plus the TI that the first distributor provided to the second distributor. But in reality, TH will be something less than this in most cases. Despite the TH definition, the DSCSA wholesale distributor requirements eliminate some of the data elements from the TH that the dispenser would receive for certain types of distributions. the initial shipment date from the manufacturer. Because an ADR who only buys a drug directly does not need to include this information in their outgoing TI and TH statements, they do not need to keep careful track of the linkage between their incoming shipments from manufacturers and their outgoing shipments to their customers. Non-ADRs, on the other hand, do need to keep track of that linkage so that they can provide all of the required data fields in their TI and TH. The non-ADR’s TH can start with their purchase from the ADR so the manufacturer’s TI that the ADR received will not appear in the TH statement the dispenser receives. This is because the ADR is not required to pass the exact TI document they received from the manufacturer. All the ADR needs to do is include an additional statement in their TS indicating that they bought the product directly from the manufacturer, exclusive distributor of the manufacturer or a repackager who purchased it directly from the manufacturer. The non-ADR must inform (in their TS perhaps?) their customer (the dispenser in this example) that they received a direct purchase statement in the TS they received from the ADR. Only wholesale distributors that do not buy drugs directly from the manufacturer must follow the formatting guidance that the FDA will publish on November 27, 2014 (see “The Flaw That Must Be Addressed in H.R. 3204, The Drug Quality and Security Act”, and “DQSA: Getting To Electronic Transaction Data Exchange”). The vast majority of drugs in the U.S. supply chain are distributed by wholesale distributors who buy directly from manufacturers. These distributors appear to be exempt from following the FDA’s data exchange guidance. The TI, TH and Transaction Statements (TS) (to be discussed in a future RxTrace essay) provided in ADR-to-distributor transactions can be spread across any combination of self-generated paper, electronic or manufacturer-provided data on the product package. Whenever an ADR sells drugs to another wholesale distributor, as in the drawing above, the product package itself appears to be considered a data exchange mechanism. Whatever TI the manufacturer provides to the ADR will probably just get filed away and almost certainly will not actually be transmitted downstream as part of their TH when the drugs are sold. These special allowances for the wholesale distributors who can buy direct make sense because these companies deal in such massive volume of product. Keeping track of it all by lot number—especially before the lot number is encoded in the machine readable barcode on each package—would be very costly and overloaded with unintended errors. 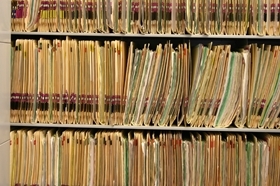 In November of 2023 the DSCSA turns into an electronic, serialization-based, one-up, one-down records retention system. At that time, supply chain parties can stop creating, passing and retaining THs. the business name and address of the person to whom ownership is being transferred. In addition, some people, notably those in GS1 Healthcare US, are worried about the duplication of the static data elements if they must be repeated multiple times in a single TH document. They are also worried about the need to include full business names and addresses in the ownership change data elements. The “from” business name and address will be repeated many, many times in their database. Most “to” business names and addresses will also be repeated many times. This could represent a huge amount of data storage and transmission space. This issue was also a concern in various preempted State pedigree laws (see “Pedigree Models and Supply Chain Master Data”). If an ADR for a given drug buys some of that drug from a non-ADR and then sells it to a customer along with some that they bought directly from the manufacturer, what rules apply? The larger U.S. drug distributors have voluntarily pledged not to buy drugs from anyone but the manufacture when they can, so this may not happen very often, but when it does, does the fact that they buy some directly allow them to always follow the direct buy rules? How is the distributor supposed to know which drug packages were received from which supplier if they are the same lot number since they are not required to make use of the unit serial numbers until late 2023? Can you think of more questions about TH? Leave a comment below. 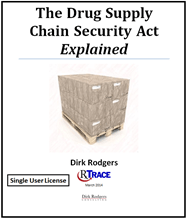 If your job requires you to understand the DSCSA, make sure you check out my new book “The Drug Supply Chain Security Act Explained”. It is a section-by-section explanation of the DSCSA and discusses many of the implications to companies in the supply chain who must implement it. It includes thousands of cross-reference hyperlinks that allow you to navigate from one point in the document to another and back with little effort. You will find it an indispensable tool for learning the DSCSA quickly. Get a copy today. The introductory price discount continues through the end of March. To learn more, click here. This post and your recent Healthcare Packaging article about the long term possibilities for AIDC call to mind the fact that pharma suppliers are sometimes being asked by regulators to follow their drugs into paients’ hands. Pharma is being asked to provide real world data and to manage the risks associated with patient self administration. Specialty pharma manufacturers may wish to use serialization to their commercial advantage and track their products to the PT. This would allow them to offer services directly to the PT, improve outcomes and have real world data to prove the benefit of their drug to payers. Smart application of DSCSA rules can have broad-reaching advantages to all stakeholders beyond compliance.